Dracut (Mass.) — Police Chief Peter Bartlett looked down at a ballistic vest meant to protect his officers while on patrol. The dark vest, also known as an external carrier, is worn outside officers’ uniforms and comes with different pouches for magazines and handcuffs. As part of a partnership with the Office of Justice, 20 vests were purchased in January for the Dracut Police Department. The total cost was $16,090 with 50 percent reimbursement from the program to the agency. This was months before Bartlett took over as chief this spring. He isn’t too fond of them. “In my opinion, they look too tactical. That, to me, looks like a SWAT team member and I don’t want to portray in the community that every officer is geared up as a SWAT team member,” he said in a recent interview at the Dracut police station. Bartlett, who stressed safety is of the utmost importance to him for his officers, has plans to move away from the external carrier in the future and replace it with a more traditional shirt external carrier or an internal carrier that is worn underneath an officer’s shirt. The chief said he isn’t totally opposed to external carriers, but he is to this particular model by Safariland. “I think this has its purpose in law enforcement, but not for patrol,” Bartlett said, adding that currently some patrol officers and supervisors wear them while on duty. Bartlett said he wants his officers to be approachable and brought up former President Barack Obama’s Task Force on 21st Century Policing, which was created to strengthen community policing and trust among law enforcement officers and the communities they serve. “One of the pillars talks about community involvement, community relationships with the police, and I don’t want to have a tactical look for my agency because I want to have a really good relationship with the community,” Bartlett said. Chelmsford Deputy Police Chief Daniel Ahern said this type of vest helps officers because it has different pockets to carry gear. 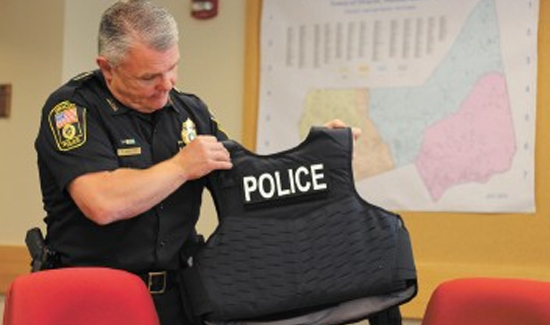 In Tyngsboro, Police Chief Richard D. Howe said he allows officers to wear what are called “outer carrier vests” which look like a uniform but contain a bullet-proof vest inside. Only a few officers wear them, he said in an email. To Russell Taylor, a union representative for dispatchers in Dracut and a former Lowell police officer, the external carriers are more about comfort for law enforcement. “The old way, you had to wear them underneath your shirt, so if you come into the station to do something you can’t take it off when you sit in a seat and do something,” he said. Taylor said he disagrees with Bartlett. i love this comment to say Police Chief. ballistic vest meant to protect for the officers.So must need to vest on his duty.